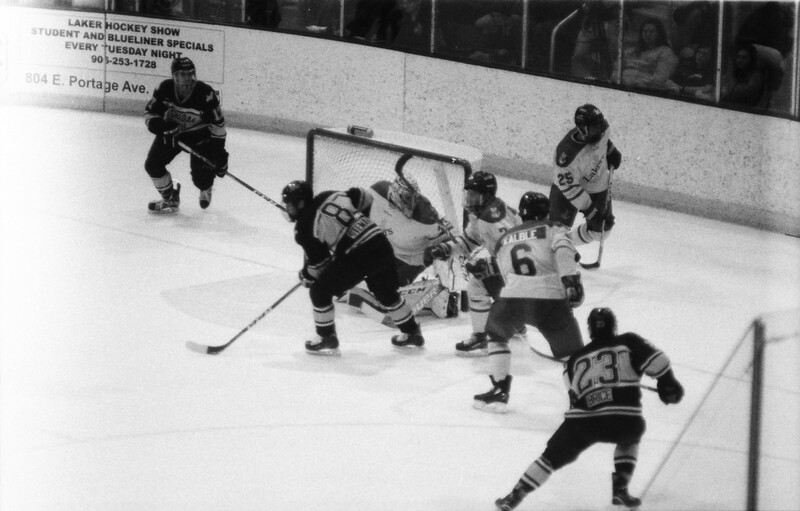 After a weekend in which Lake Superior looked as though they may shock the college hockey world in Denver, the Lakers fell flat against their former Central Collegiate Hockey Association foe Michigan State down in East Lansing. The Lakers (1-5-2, 0-1-1 WCHA) put together a third period rally that fell just short on Friday night, before the Spartans (4-2-0, 0-0-0 Big Ten) shut out the Lakers 6-0 on Saturday. A third period rally fell just short, as the Lakers scored 3 goals in the third period to cut the Spartan lead to one. 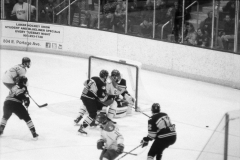 Lake Superior could not find that crucial fourth goal, however, in a 4-3 Friday loss to Michigan State. Lake State started off on the wrong foot in the first period, when Sam Saliba put the puck behind Laker goaltender Nick Kossoff. 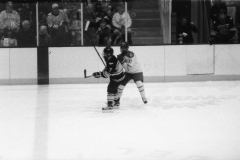 Saliba had one of 15 shots for the Spartans in the first period, making the game begin to feel like the series against Denver, where Kossoff and Mareks Mitens were peppered with shots on both nights. The Lakers only mustered 4 shots of their own against Spartan netminder John Lethemon. The second period was more of the same, as Michigan State continued to badly outshoot Lake Superior. Patrick Khodorenko gave his team a 2-0 lead just before the midway point of the game. The Spartans made it 3-0 when Jake Smith scored unassisted with 3:08 remaining in the period. 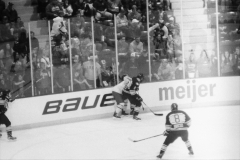 Early in the third period, Michigan State made the Lakers’ hole even deeper when Logan Lambdin beat Kossoff to give his team a 4-0 lead. Shortly afterwards, however, Lambdin was whistled for tripping and on the ensuing delayed penalty, Brayden Gelsinger got his team on the board with this third goal of the year. With Lambdin serving his tripping penalty, Lake Superior’s power play went to work. With 0:06 remaining on the power play, Bryan Basilico earned his first of the season at the 3:49 mark of the third period, with assists from Gelsinger and J.T. Henke. After killing off a cross-checking penalty by Gelsinger, Matt McArdle was sent to the sin bin for the same infraction. Luckily, Michigan State’s Cody Milan took a tripping penalty to shorten the man advantage for the Spartans. With Milan still in the box, Max Humitz scored his team-leading fourth goal of the season. With the Lakers on the verge of tying the game, Michigan State played tight defensively, holding the puck along the boards to prevent any more Laker chances. The Spartans were successful in that endeavor, as they survived the Lake Superior rally to win the game 4-3. For the Lakers, Gelsinger factored into each goal scored by his team, while Humitz had a goal and an assist and Henke had two assists. For the Spartans, Logan Lambdin had a goal (the game winner) and an assist on the opening goal by Saliba. In special teams, the Lakers converted on 2 of their 4 power play opportunities. Michigan State, meanwhile, went 0 for 3 on theirs. In net, Kossoff made 37 saves on 41 shots, while Lethemon stopped 19 of 22. After nearly coming from behind to win the previous night, the Lakers essentially fell flat on Saturday, as the Spartans scored four goals in the second period to thump Lake Superior 6-0. Mareks Mitens got the call to start from Lakers head coach Damon Whitten, while Spartans’ head coach Danton Cole sent John Lethemon back out. While shots in the first period were much closer than the 15-4 margin the night before, Michigan State still outshot the Lakers 8-7, including the shot that mattered, as Mitch Lewandowski scored a power play goal with 1:27 to go in the opening frame. The second period was a period to forget for Lake Superior, as they managed one shot on Lethemon the entire period. Michigan State, meanwhile, had 16 shots, including four that found the back of the net. Brennan Sanford made the score 2-0 Spartans on a delayed penalty to Brendan McKay for hooking. After killing 1:13 of the Michigan State power play, Carson Gatt of the Spartans went off for interference. On the ensuing 4 on 4, Mitch Eliot scored his first goal of the season. 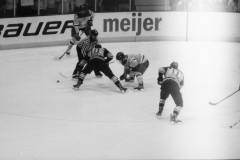 Michigan State added two more goals before the period was over, as Jake Smith scored his second goal of the season (and of the series) and Lewandowski earned another power play tally – this time with only 0:22 seconds left in the period. To start the third period, Mitens was relieved in net by Nick Kossoff. Mitens made 19 stops on 24 shots. 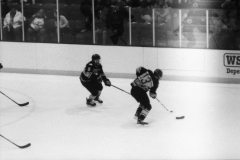 The Spartans added one more goal when David Keefer – on the power play – scored his first goal of the season, making the score 6-0. That score stood the rest of the way, going down as the biggest defeat of the season for Lake Superior. The Spartans converted on 3 of their 8 power play opportunities. Lake Superior was denied on all 4 of theirs. Kossoff stopped 9 of 10 shots. Lethemon earned his first shutout of the year by stopping all 16 shots by Lake Superior. Two notable absences from the lineup were defensemen Collin Saccoman and Lukas Kaelble. Both are believed to have sustained undisclosed injuries during the series against Denver. 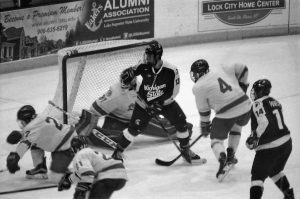 Lake Superior returns to the confines of the Taffy Abel Arena this weekend, when they take on the University of Alaska-Anchorage. The Seawolves (0-5-1, 0-0-0 WCHA) were idle this past weekend. 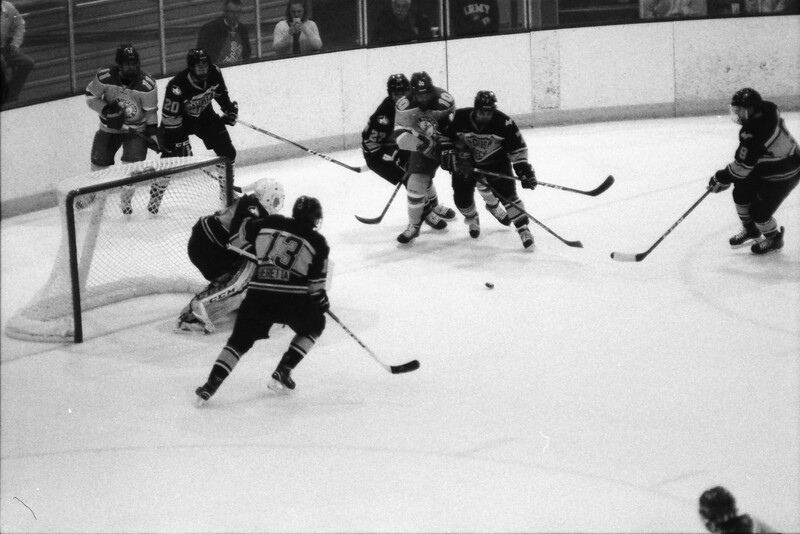 Although they have not started league play yet, they did play a non-conference set against league foe (and interstate rival) Alaska-Fairbanks. The Nanooks swept the Seawolves 6-2 and 3-2. Puck drop is at 7:07 p.m. on Friday, November 4th. 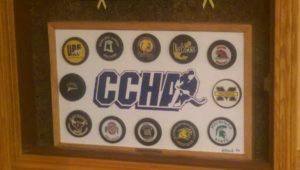 Made by Lakers video assistant Jim Howie, this display board shows pucks from the various schools in the now defunct Central Collegiate Hockey Association. The Lakers and Spartans were conference foes from 1981 until the dissolving of the league in 2013. Michigan State’s Brennan Sanford (13) attempts to screen LSSU netminder Gordie Defiel (31) in a meeting between the clubs last season. The Lakers swept the Spartans, outscoring them 13-4 in the two games. Another week, and another mention of major changes within college hockey. After six years of being the bench boss for the Spartans, Tom Anastos (71-98-20) stepped down as head coach with former NHL veteran Danton Cole (318 GP). 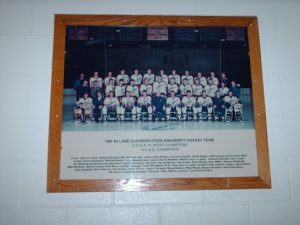 This year’s Michigan State team looks much different than the team the Lakers faced off against last year during GLSW, where they clobbered the Spartans 6-1 & 7-3. They’ve split the last two weekends, both home-and-homes with Bowling Green and Western Michigan, making their home record perfect for the year. Leading the scoring are a pair of sophomores and a freshman. In four games sophomore forwards Patrick Khodorenko has posted a 3-3-6, Taro Hirose a 2-4-6 and freshman forward Mitchell Lewandowski has a 1-5-6. Goaltending is led by sophomore John Lethemon who has a 2-1-0 in four games (Ed Minney looks to have started a game with 3 goals against in 10 minutes). Lethemon has a 2.36 GAA and a .917 save percentage. Last weekend was a mixed bag of emotions for Laker fans. The boys in blue faced off against the reigning national champions, Denver, for a two game series. Junior goaltender Nick Kossoff broke a school record facing 66 shots, and saving 63 of those on the way to a 3-3 tie. Denver tied the game up at the 16:26 mark of the third. The tie did put a bit of a hamper on the Pioneer’s night as they raised their championship banner Friday night. Saturday night was a different story. Mareks Mitens faced 54 shots, saving 49 on the way to a 5-1 loss. One thing did remain the same, however: seemingly a lack of offense and defense. Both nights the Laker goaltenders were peppered with shots, and they only recorded 17 shots (Fri) and 16 shots (Sat). While these numbers were kind of expected, going against the number 1 team in the nation, they are also quite shocking to see on a box score. We also lost two defensemen in Colin Saccoman and Lukas Kaelble to injury. No timetable has been announced as of this release. But I think the Lakers did send a message to the college hockey nation. I’m not sure there are any other teams in the nation that could lead Denver for 5 of 6 periods. On the surface, this seems like a very good thing, and in many ways it is, but I’ve already seen one scout at Abel Arena, and I would fully expect to see more after this past weekend. The players know this, and I hope that the leadership group on the team, along with the coaching staff, keep them focused on team play & not individual play. It was readily apparent at the end of last season that many players were playing for themselves and not the team – that cannot happen if we hope to succeed. The Lakers will need at least a split on the weekend to gain some momentum going into the month of November. They will have one WCHA series to start the month against Alaska Anchorage before going on the road for two weeks against Bowling Green and Alabama-Huntsville before wrapping up against the US U18 team. It doesn’t get much easier from there. 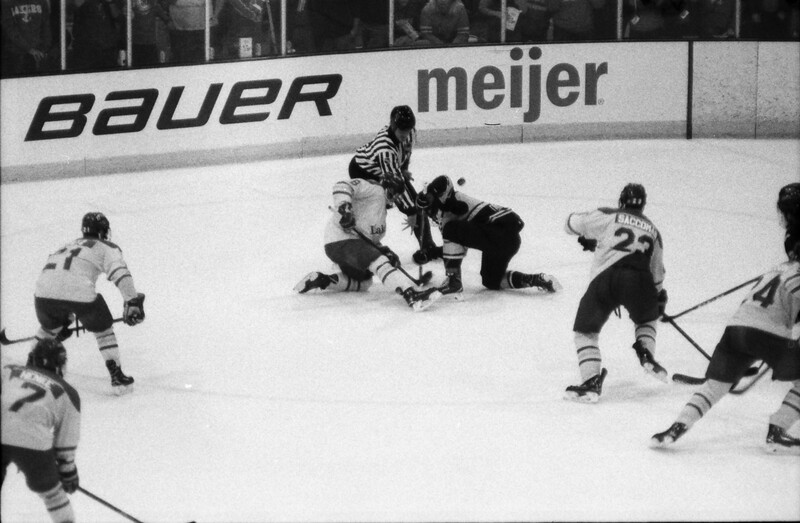 This weekend looks to be a fun one as a former CCHA rivalry is renewed again. Each year that the two teams have played since realignment has been very physical, almost as if they still play each other four times a year and this year does not look to be any different. The Spartans are playing tougher than they did last season, and the Lakers have gained some size in the offseason. Without knowing how Danton Cole coaches, it is hard to say what the keys to success will be for this weekend. With former coach Anastos, you kind of knew his coaching style and what to expect from his teams. My gut feeling is that the Cole era will force a power shift within the B1G, with this being his first step. Locally the game will be broadcast on 99.5 YesFM where Bill Crawford will be calling the game from Munn Ice Arena. It looks to be streamed on BTN Plus. As always, the Laker Legion will be hosting viewing parties for both games – Friday night at Peacock Cove in the Cisler Center and Saturday night in the Library lecture hall just outside the doors to the library – completely free of charge. 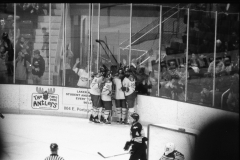 Going into their series against the University of Denver, few people gave Lake Superior a chance. After all, their opponent was the defending national champions, a team that brought back most of the essential pieces from the title run seven months ago. The Pioneers’ broadcast media showed no respect for the Lakers, boastfully predicting that Denver would see no trouble from their opponent in the two game set. And yet, despite the odds against them, Lake Superior showed grit, resolve and determination, forcing the Pioneers to come from behind on both nights. While shots on goal were incredibly lopsided (66-17 on Friday, 54-16 on Saturday), goaltenders Nick Kossoff and Mareks Mitens held the nation’s top-ranked team in check for five periods over the weekend, as Lake Superior tied the Pioneers 3-3 on Friday, before falling 5-1 on Saturday. The story Friday night was Nick Kossoff. Kossoff, with 63 saves on 66 shots (.955 SV %), set the school record for saves in a game, breaking Matt Violin’s 60 save record against Alaska in January, 2003. 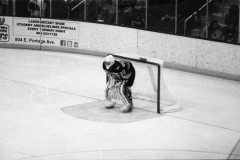 In addition, Kossoff bested the 57 saves made by Gordie Defiel against Minnesota State-Mankato in the 2016 WCHA Tournament for the best mark in the Damon Whitten era. Lake State drew first blood when Max Humitz passed the puck to Brayden Gelsinger, who one-timed it past Pioneers netminder Tanner Jaillet. Jaillet, the reigning Mike Richter Award winner, allowed 3 goals on 17 shots – a .824 save percentage on the evening. 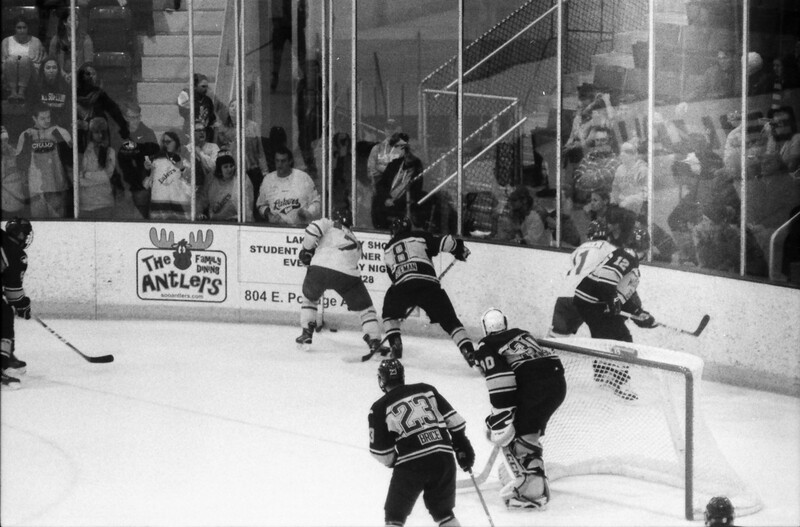 Early in the second period, the Lakers went up 2-0 when Gelsinger dug a puck out from behind the net, where Denver’s Henrik Borgstrom was waiting. Borgstrom was unable to control the puck in front of the net, where Humitz collected it and buried it behind Jaillet. Just past the midway point of the game, Borgstrom got Denver on the scoreboard. His goal sent the teams back to the dressing rooms with the score 2-1 Lakers after 40 minutes. With about 8 minutes remaining in the game, Borgstrom managed to hit Dylan Gambrell with a long pass, who got in alone on Kossoff and scored, tying the game. The Lakers answered back 2:30 later, when Jake Hand notched his second goal of the season on a turnover behind the Denver net. The Pios came right back, however, as Liam Finley retied the game exactly two minutes after Hand untied it. 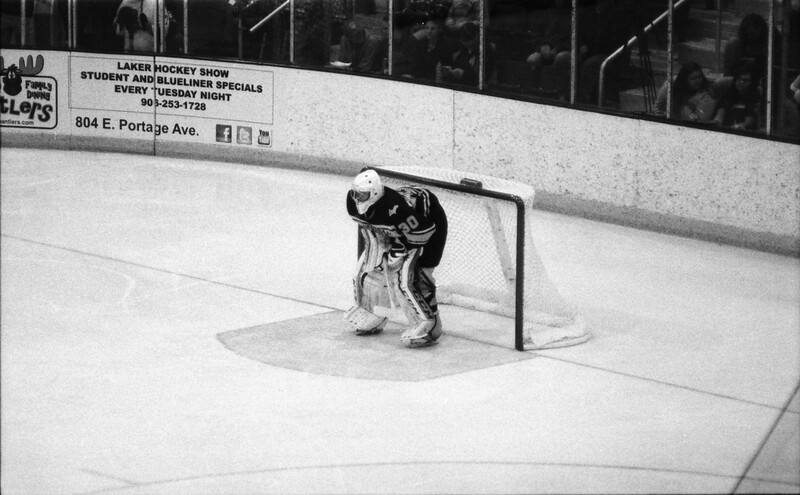 As the game wore on, Kossoff continued to see more and more rubber each period. Denver’s shot total increased from 17 in the first period, to 19 in the second, to 28 in the third. Nevertheless, Kossoff kept his team in the game in spite of the mounting offensive pressure. 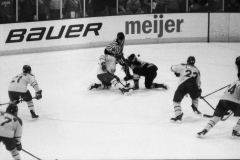 With the game tied at the end of regulation, the standard five minute 5-on-5 overtime was played. Neither team could score, and both had difficulty getting shots on net, as the Lakers managed only one and the Pioneers only mustered two. 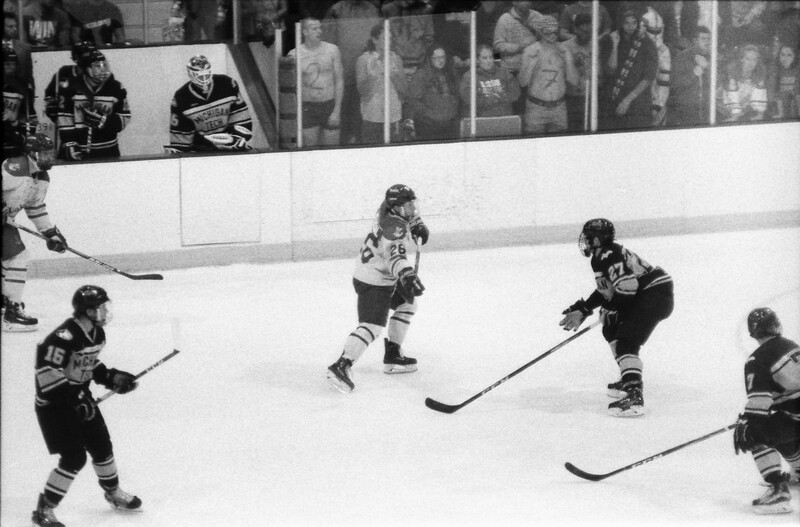 Since both leagues play 3-on-3 overtime, a five minute session was played, solely as an exhibition. Denver scored a goal in the session to unofficially win the game; the NCAA still recognizes the game as a tie. Early in the third period, Lakers defenseman Collin Saccoman took a hit and fell to the ice. He did not return to the game. 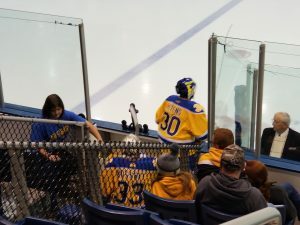 Both clubs opted for a change in net, as Lake State started Mareks Mitens in his second collegiate game. 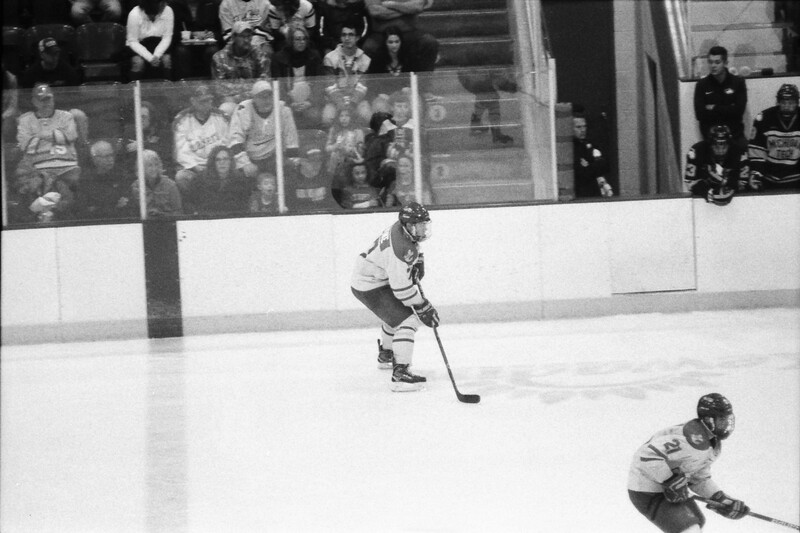 Making his college debut for the Pioneers was Dayton Rasmussen. A 3 goal third period made the game look less of one, but Mitens still made 49 saves – a respectable .907 save percentage on the night. Much like Kossoff the night before, Mitens was peppered with shots all through the night. As they did on Friday, the Lakers struck first when Josh Nenadal deflected a William Reidell shot under the crossbar and behind Rasmussen. 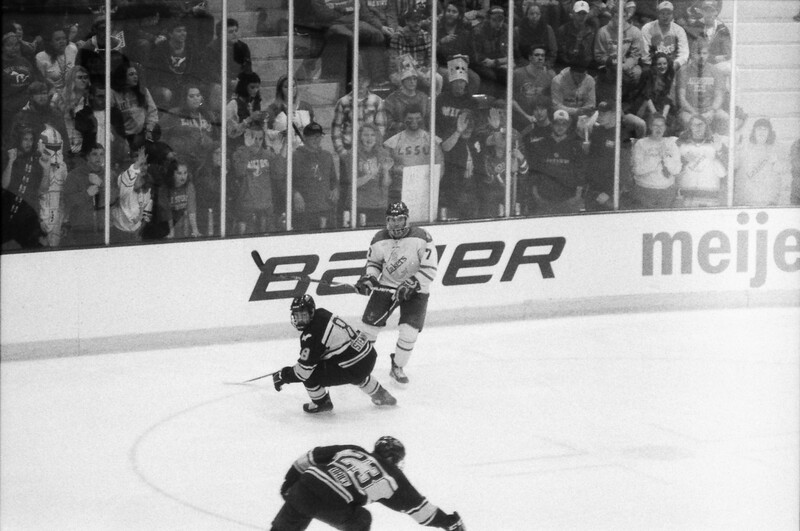 Denver tied the game later in the period, when Troy Terry beat Mitens. That made the score 1-1 after 20 minutes. In the second period, the Lakers hung tight with the Pioneers, even outshooting them 8-7 at one point. A critical turning point in the game came when Jake Hand and Diego Cuglietta were both called for penalties, giving Denver a full two minutes of 5-on-3 hockey (Hand drew the initial penalty while Cuglietta’s came while the Lakers were attempting to touch up the puck). On the man advantage, Terry netted his second of the night. Denver set the tone for the third period early, as Michael Davies scored on Mitens with under a minute gone. The Pioneers took a 4-1 lead just before the 9:00 mark on a goal from Griffin Mendel. 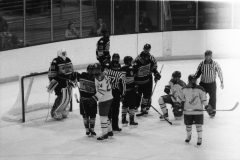 The Lakers had an opportunity to climb back into the game when Denver’s Blake Hillman received a 5 minute major and game misconduct for contact to the head. The Pios’ penalty kill kept Lake Superior off of the board. Denver nearly made it 5-1 when Logan O’Connor got in on Mitens while shorthanded. O’Connor received a slash from Tyler Anderson on the play, causing him to be awarded a penalty shot. Mitens turned O’Connor away. The Pioneers added a late goal by Jaakko Heikkinen on their way to a 5-1 victory. Lake State takes on former CCHA foe Michigan State in non-conference action this Friday and Saturday. Both games will be at the Munn Ice Arena, starting at 7p.m. both nights. Last year, Michigan State travelled to the Soo, falling 6-1 and 7-3 on Great Lake State Weekend. Crimson and Golder, Over and Over…. The Denver Pioneers are coming off an outstanding 2016-2017 season having won their eighth national championship, their first since back to back wins in 2004 & 2005, and this weekend will be their first weekend back at Magness Arena this season. The clear-cut #1 team did take a big hit after the tournament, losing 9 seniors, including their captain Will Butcher (New Jersey Devils). They are, however, returning Jarid Lukosevicius, who was the first player since his own head coach to record a hat trick in a championship game. 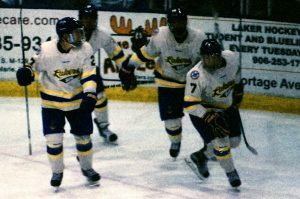 His coach, Jim Montgomery, played for Maine in college, and recorded his hat trick against the team they will be facing this weekend: the Lake Superior State Lakers in 1993. Maine won that game & their first championship in school history. After splitting with Notre Dame on the weekend, the Pioneers will be looking for a sweep of the Lakers when they hang their banner this weekend. There is some good news going into this weekend: The Lakers and the Pioneers both have the same amount of wins this season. 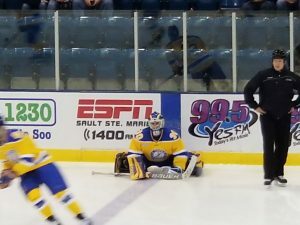 Joking aside, last Saturday we had our first real look at who could be our starting goaltender for the rest of the year (and hopefully more) – Mareks Mitens. Mitens is coming off a record setting year in the NAHL, but when we first saw him during the blue-gold scrimmage, he didn’t look great. I don’t know what happened in the last few weeks, but he stopped 40 of 42 shots on net against a good Michigan Tech team, forcing a tie with an eventual loss in the shootout. JT Henke was named the WCHA Offensive Player of the Week after a 5 point weekend (1-4=5), being in on each one of the 5 goals the Lakers had last weekend. 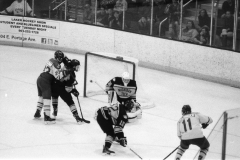 Being able to keep pace with a really good Michigan Tech team bodes well for boys in blue, as Tech has been the preverbial monkey on the Lakers back since joining the WCHA, having only won once, under former coach Jim Roque, and forcing a 1-1 tie back in 2015. One game was a 4-2 loss, with the others being blowouts. This bodes well for the Lakers. Despite taking only one point last weekend, they are closing the gap on their rivals. That should be the message in the locker room this weekend. They are improving, and to this author, the team, nearly as a whole, has been passing the eye test. They have solid goaltending in Kossoff and Mitens (we have not seen Lukenda or Bengert in net since the scrimmage – or Bengert in uniform since), the blue line has been tightened, and the offense is clicking. Their Power Play is third in the nation for goals. The Lakers, in all honesty, don’t have much to lose this weekend. Yes, the WCHA non-conference record would suffer, but I doubt many people are expecting the Lakers to win this weekend; even the most optimistic fan would likely say they just hope they play a good game, and keep the score close. But the Lakers have everything to gain this weekend. Coming out with a win on Friday may put doubts into the Pioneers heads, allowing them to make mistakes Saturday night. A win this weekend would force the rest of the league to take notice of Lake State again. A win would give the team confidence that they can win despite the last twenty years that says the contrary. Games this weekend start at 9:05pm eastern time. They can be heard locally on 99.5 YesFM, or online at http://1043thefan.com/. Please note that YesFM will not be streaming it online. Game can also be streamed through NCHC.tv (15.95/day for just Denver). The Western Collegiate Hockey Association (WCHA) announced the recipients of its Players of the Week honors for games during the week of October 8th. Among the honorees was Lake Superior senior forward J.T. Henke, who earned Offensive Player of the Week. J.T. Henke (far right) celebrates a goal against Michigan State in October, 2016. Henke was selected as WCHA Offensive Player of the Week for his performance against Michigan Tech on Oct. 13 &14, 2017. 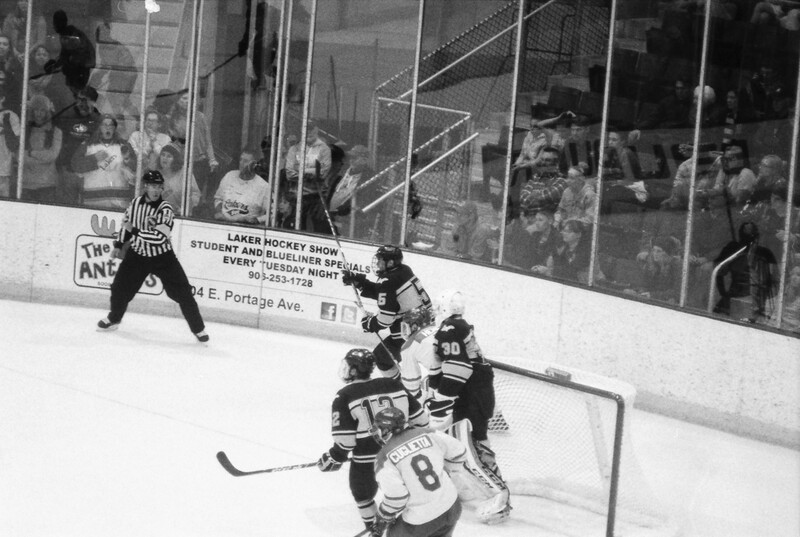 Henke scored one goal and four assists in the weekend series against Michigan Tech. On Friday, Henke had three assists in a close 4-3 loss to the Huskies, who came in ranked 13th in the USA Today/USA Hockey Magazine Men’s College Hockey Poll and 15th in the USCHO.com Poll. On Saturday, Henke scored the first goal of the game and later assisted on the game tying goal in the third period from Anthony Nellis. With his assist on the Nellis goal Saturday, Henke had an assist on every Laker goal on the weekend that he didn’t score himself. Henke currently is tied for 11th nationally in scoring with six points. In the WCHA, his five points in conference games – all coming this past weekend – have him at the top of the league in scoring. This is the first time Henke has received weekly WCHA accolades in his Laker career. Among the other nominees he beat out for the honors was one of his opponents from the weekend – Gavin Gould of the Huskies. Among the nominees for other Player of the Week positions was freshman goaltender Mareks Mitens. Mitens, who officially made 40 saves in his college hockey debut, was nominated for Rookie of the Week. Mitens also made seven saves in the 3 on 3 overtime, including a stop on a Mark Auk penalty shot, but those saves ultimately do not count in his overall stats. 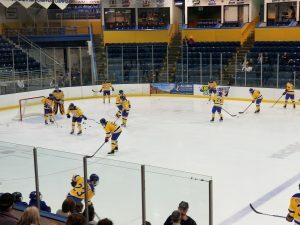 The Lake Superior State hockey team played their annual Great Lake State Weekend series on Friday, October 13th and Saturday, October 14th. This year’s opponent was Michigan Tech, the same team who eliminated Lake Superior from the WCHA Tournament at the end of last season. While the Lakers have had a historically rough track record against the Huskies, promise was shown in two very tight, very close games. The Huskies held off a late rally on Friday night to win 4-3, before skating to a 2-2 tie on Saturday. Michigan Tech claimed two points on Saturday on virtue of a shootout victory. The Lakers started off Friday night on the wrong foot, when Tech’s Gavin Gould scored 1:05 into the game. The Huskies got a late goal from Jake Jackson to go back to the locker room up 2-0. In the second period, the Lakers got one back thanks to Max Humitz. 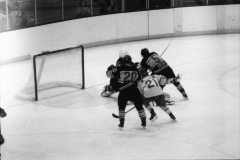 Humitz beat Huskies goaltender Patrick Munson while on the power play to make it 2-1 in favor of Michigan Tech. Early in the third period, the Lakers’ Anthony Nellis tied the game with his second goal of the season. 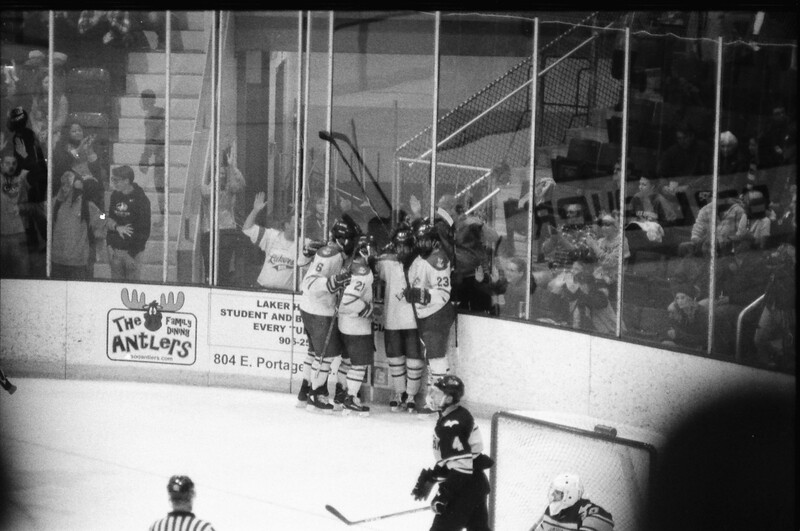 With the game tied, the Lakers came out in full force, pressuring the Huskies while looking for the go ahead goal. The Huskies, however, kept the Lakers off of the board, and Tech’s Gould squeaked a puck past Kossoff for his second of the night. Less than a minute later, Greyson Reitmeier put a puck behind Kossoff to make the score 4-2 in favor of the visitors. A power play goal from Brayden Gelsinger with 2:22 left in regulation put the Lakers within reach. 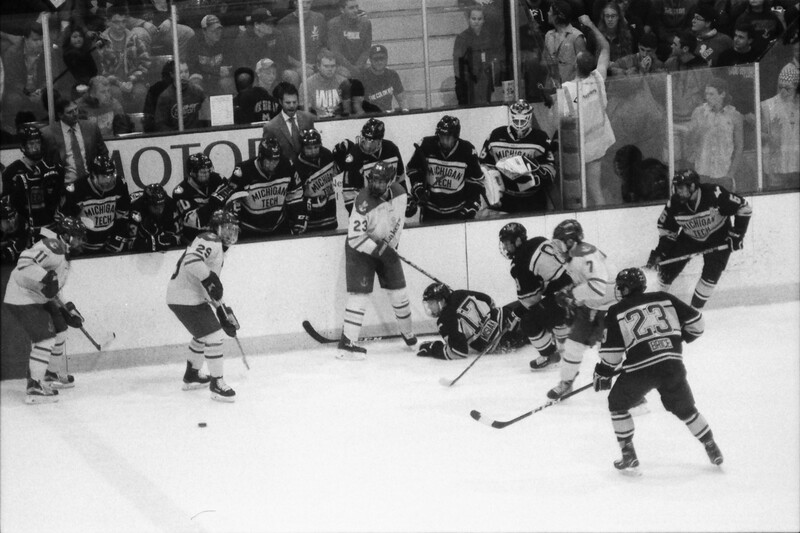 Despite pulling goaltender Nick Kossoff, however, the Lakers were unable to solve Munson again. In net, Kossoff made 26 saves on 30 shots, while Munson made 21 saves on 24 shots. A change in net occurred for the Lakers, as freshman Mareks Mitens received the start in lieu of Nick Kossoff. A native of Ventspils, Latvia, Mitens played for Aston in the NAHL last season, where he was named goaltender of the year and league MVP. Lake Superior drew first blood on Saturday, when senior J.T. Henke put the puck behind goaltender Munson in a scramble in front of the net. With the goal, plus an assist later in the game, Henke leads the Lakers with 6 points on the year. The Huskies struck back on the power play, as Joel L’Esperance scored on Mitens while LSSU’s Gage Torrel was off for cross checking. Tech added another goal about a minute and a half later when Alex Gillies made it 2-1 Tech. After outshooting the Lakers 17-5 in the first period, the Huskies continued their barrage on Mitens in the second period, outshooting Lake State 9-5. Mitens stood up to the challenge, however, keeping Tech off of the board in the period. 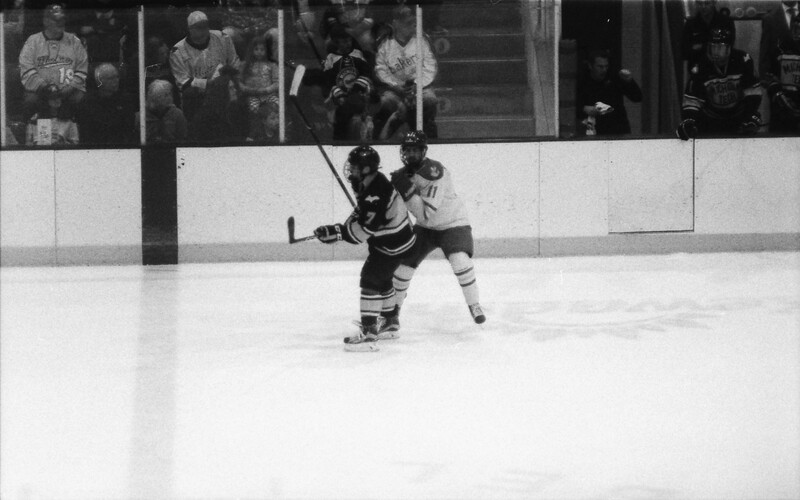 Early in the third period, Anthony Nellis briefly appeared to tie the game for Lake Superior while on the power play. A video review showed the puck hit the corner of the crossbar. Nonetheless, the Lakers ramped up their offensive pressure on the Huskies in the third period, outshooting them 13-10 in the period. Only a few minutes after appearing to tie things up, Nellis scored his third goal of the year, tying the game for real this time. While both teams had their chances to end the game in regulation, Mitens and Munson did not allow a goal the rest of the way, sending the teams to overtime. After nobody scored in the 5 on 5 overtime, a 3 on 3 overtime was played. Again, the goaltenders kept their opponents off the scoreboard, necessitating a shootout. Mitens had a bit of extra work to get his team to the shootout, as Tech’s Mark Auk was awarded a penalty shot with under a minute remaining in the 3 on 3. In the shootout, Mitens and Munson matched zeros trough three rounds. In the fourth round, Tech’s Jake Lucchini got the puck over the right pad of Mitens. 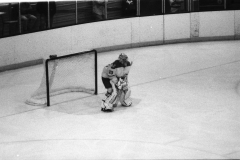 Munson then stopped Max Humitz to end the shootout. With the shootout win, the Huskies took 5 of a possible 6 points against the Lakers in WCHA play. The teams meet again in Houghton on December 15th and 16th. Mitens finished with 40 saves on 42 shots. 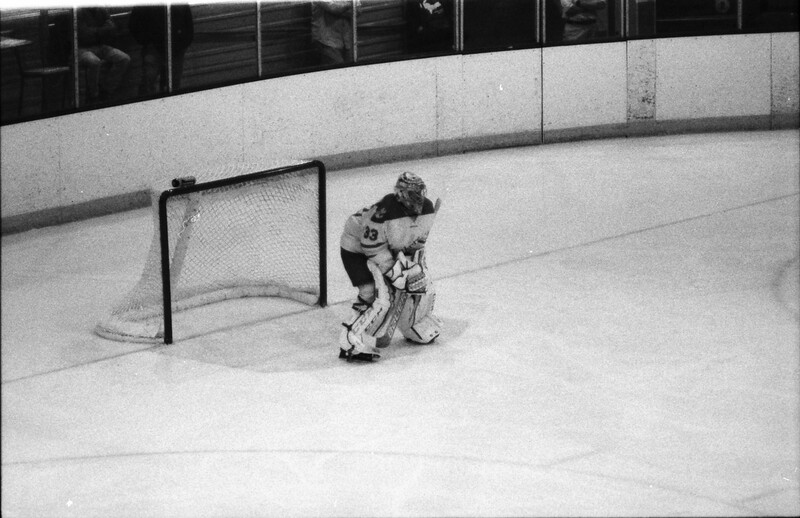 Munson made 22 saves on 24 shots. Next week, the Lakers are off to Denver to face the defending national champions. The Pioneers (1-0-1, 0-0-0 NCHC) are coming off a win and tie against Notre Dame. Puck drop on Friday is 9:35 p.m. eastern, while Saturday’s contest starts at 9:05 p.m.
Not only did the Lakers debut brand new home jerseys tonight (see previous post), a brand new item of wall decor was added to the northern wall of the Taffy Abel. This new wall highlights all of the Laker Hockey Alumni who have gone on to play one or more game in the NHL. A smaller version of this wall currently is displayed in the Laker locker room. To view the new wall, check out the video below! Here is your first look at Lake States new jersey. As of the time of this posting, it remains unclear if they are one offs or not. We will have to wait and see. Rumor: LSSU to debut new jerseys for GLSW? Update 10/13 @ 7:31pm: It looks like there will be no new jersey debuted tonight. A rumor has been making it’s way through the ranks that the Lakers will be debuting a new jersey tonight for GLSW. This is supported by the fact that last year the same happened. 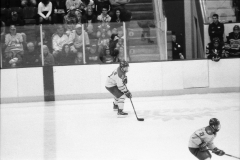 Players hit the ice in throwbacks to the 1970s with their stylized ‘Soo Lakers’ on an offwhite base. These were later used during Pink in the Rink weekend and auctioned off. If this rumor does prove true, then I would expect the same to happen this year. Although there is no information about what the jerseys will look like, I feel like it will be another throwback. I doubt it will be a set of the goods that were used in the 2010-2011 season as they are recent, though the goods used in the late 90’s could be a possibility. However, this writer would love to see a throwback to the 1980s-1990s uniforms, when the Lakers won their three championships. I do doubt it will be a pink uniform. But we will have to wait and see until either warmups or when the teams hit the ice before the first. After an outstanding 2016-2017 campaign, a number of changes happened in Houghton, MI during the offseason that lead many to believe that dark days were coming for the Huskies. Outstanding goaltender Angus Redmond, who led the Huskies to a #2 WCHA & #19 NCAA finish last season left the team to go pro with the Aniheim Ducks organization (and is currently assigned to the San Diego Gulls of the AHL). In addition to Redmond, Michigan Tech also lost their Head Coach, Mel Pearson, to take over for long-time Michigan head coach Red Berenson who retired after 33 years of coaching the Wolverines, ending with an outstanding 848-429-92 record. 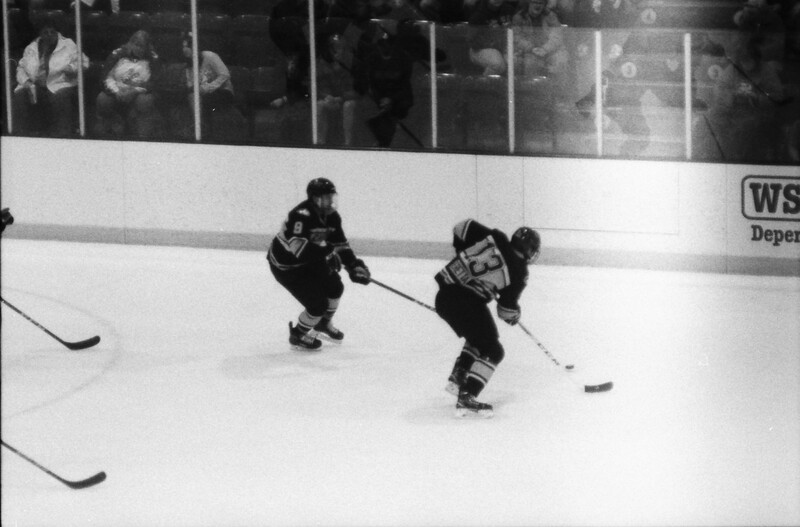 The Tech vacancy was filled by former assistant coach, and Sault Sainte Marie native Joe Shawhan who played for the Lakers from 1982-1987 & was a volunteer coach for their 1992 & 1994 national championships. Last week, however, critics were silenced as Tech doubled up #16 Union and beat #6 Minnesota-Duluth to win the annual Ice Breaker tournament. The huskies hope to continue that streak this weekend against the Lakers. Those of us who were at Abel Arena on Friday last week for game 1 against NMU would think that this year was the year, much the same was as we did last year against Michigan State during GLSW. The Lakers beat the Wildcats 5-3 in the first game of a home-and-home series. Diego Cuglietta scored two goals for the Lakers, with the others coming from Max Humitz, J.T Henke and Anthony Nellis. Freshman Lukas Kaelble assisted on 3 of the 5 goals. Saturday night was a different story, however, as NMU outscored the Lakers 4-1 with the final 3 goals coming late in their respective periods. Philip Beaulieu scored the game winning goal at 19:20 of the second, with goals 3 & 4 coming at 18:01 and 18:28 of the third. 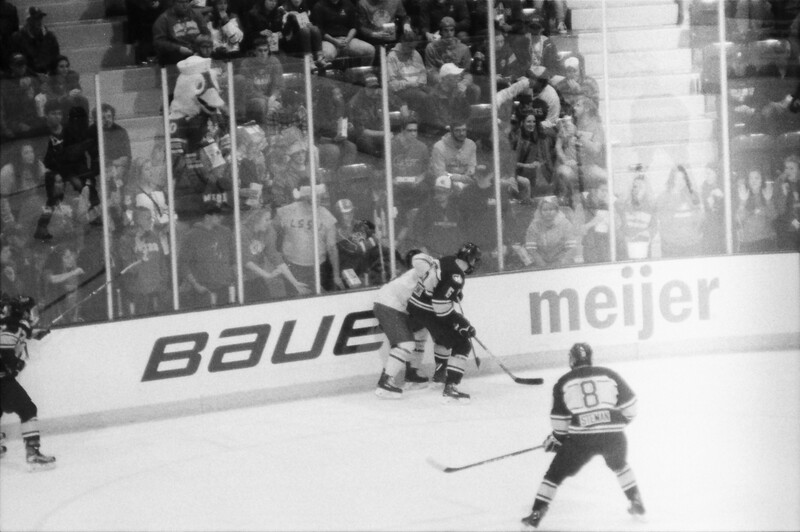 The Lakers know firsthand just how dominant Michigan Tech can be after being trounced in the first round of the WCHA playoffs last year, losing 6-4 and 8-0. They also have not won a game against Tech since bench boss Damon Whitten took over. The keys for the Lakers this weekend is to close out periods & not to give their top scorers in Joel L’Esperance and Mark Auk any good looks at the goal. Whitten also has to not be gun shy in pulling a goalie or shortening the bench if a player does not perform. The Huskies are a team that will take advantage of anything you give them. On paper, they have it all: goal scorers, a solid blueline & a barn full of goalies, but all of that is for naught if you can’t finish a game as strong as you started it. The games start Friday night at 7:37pm and Saturday at 7:07pm, and will be part of the GLSW celebration.